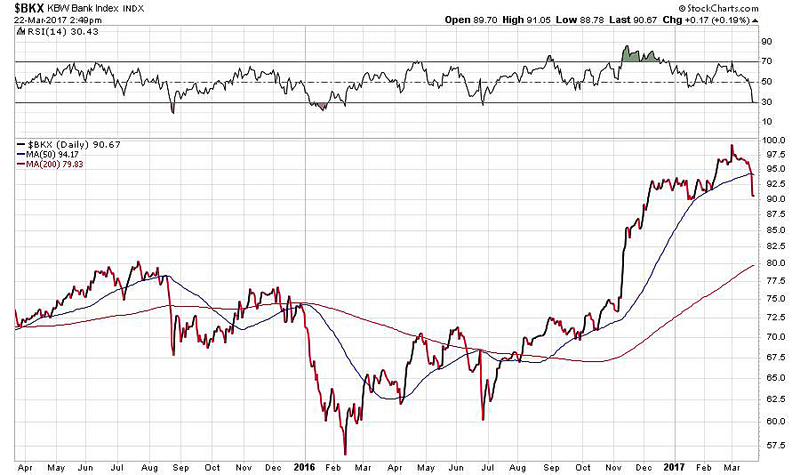 Bank Stocks Telegraphing a Turn? We have been waiting for the Trump narrative to exhaust itself so that real news can be taken seriously again. Yesterday, we may have got the first signs of that exhaustion. Let’s remember the narrative. Trump policies will be passed almost immediately, resulting in an economic surge: faster inflation, faster growth, higher interest rates and a stronger dollar. Never mind that no one knew what the actual policies would be. This was a fantasy designed to miraculously rescue us from eight years of slow growth, a rising debt load and deflation fears. 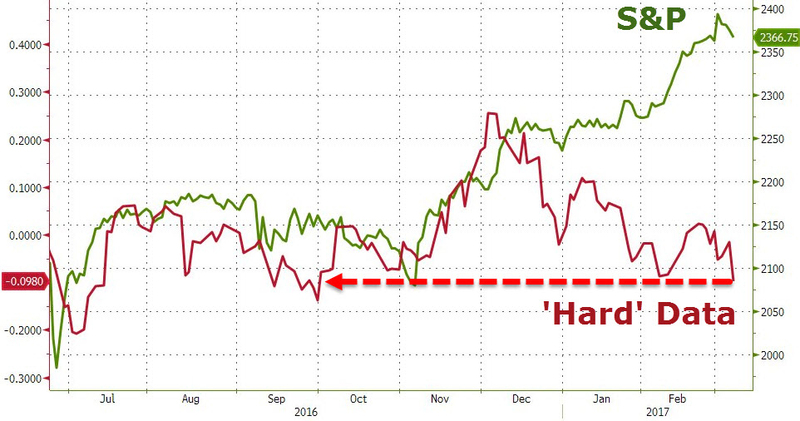 So investors bought the dollar and stocks and sold bonds and gold. The biggest beneficiary of this narrative was bank stocks. From election day on November 8th to the March 1st high, the BKX bank stock index soared 32%, the equity leader of the pack. Why? 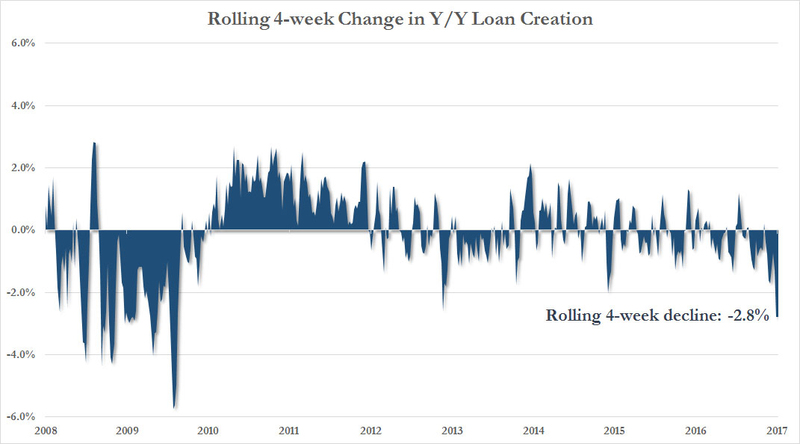 Faster growth would mean more lending. Higher rates would steepen the yield curve and increase the interest rate spread. The result: higher bank profits. Yesterday, the BKX fell 4.77%, leading the market down. Today, banks stocks were flat; no bounce at all. To me, the Trump narrative has been dented. Already there are news stories that the market took a hit because the Republicans are having problems passing the replacement for Obamacare. Everyone wants a simple explanation. But don’t be fooled. The Obamacare problems are not new. It’s only because the market is down that investors can now see and respond to bad news. The reality is that this historically overvalued market had to take a hit sometime and yesterday was the day. The question now is this: Is bad news now bad news? There is lots of bad news if the market wants to start paying attention to it. 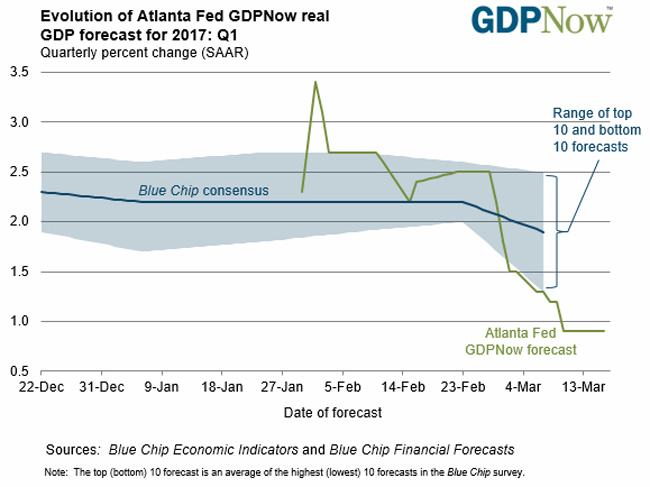 In just six weeks, the Atlanta Fed has marked down its estimate for 1st quarter GDP from 3.4% to 0.9% (see below). The economic hard data has turned down while the S&Ps have soared (see below). 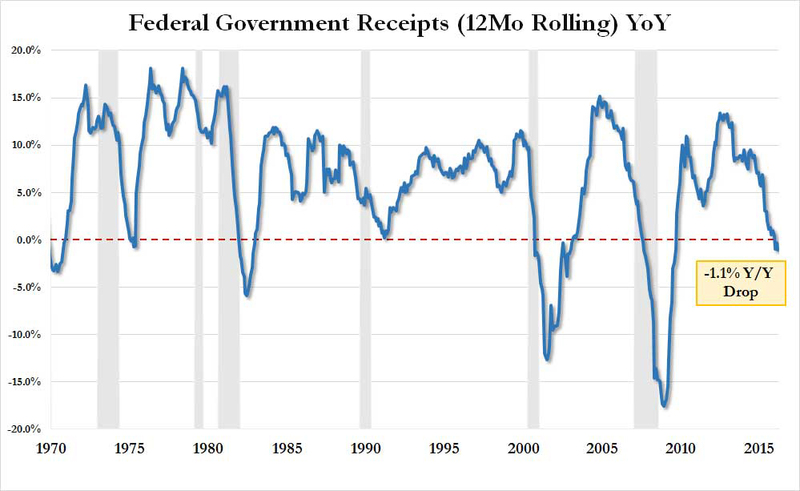 US Treasury Receipts are down year-over-year for the third straight month (see below). 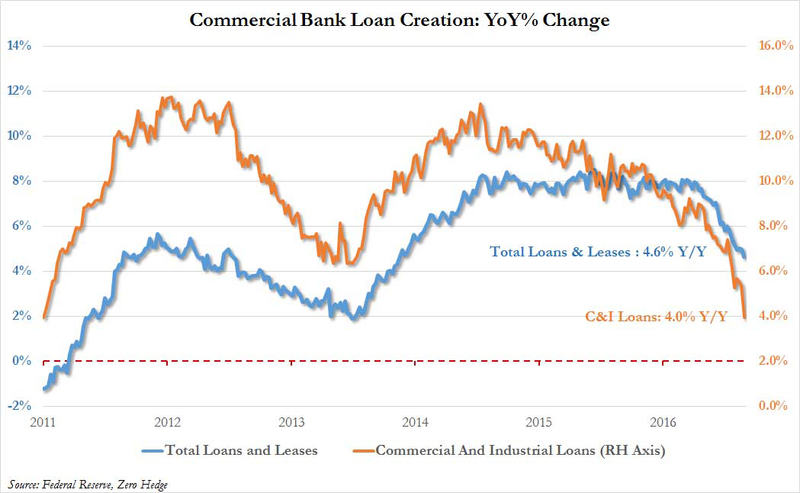 Commercial bank loans, a key requirement for economic growth, are trending down (see below). 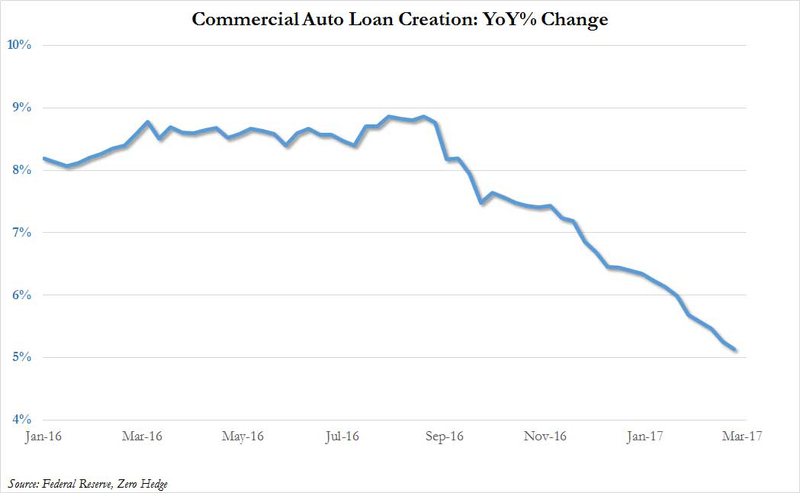 As shown in the chart below, the growth in Commercial and Industrial loan creation has tumbled by 2.8%, the biggest monthly slowdown going back to the financial crisis. The rate of increase in consumer lending is also on the decline (see below). As lending slows down, so does the money supply. Below is a chart of the three month rate of change (ROC) in US True Money Supply (essentially the M2 money supply minus money market funds which are really a security and not actual money). It’s falling fast. 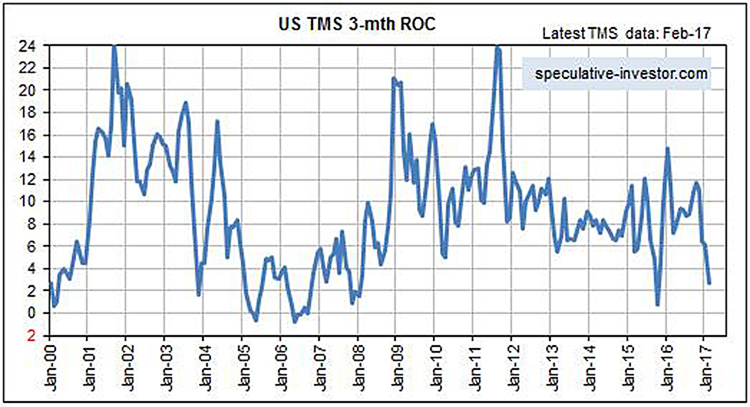 Over the past nine years, the US TMS three month ROC was only lower once, in October 2015, just prior to the start of a three month stock market decline that took the S&P500 down by 14% from its high. There’s lots of bad news if the markets decide to give it attention, especially in the banking sector. Why else would Deutsche Bank, Europe’s most important financial institution, announce a new equity financing last week at a whopping 35% discount to the market price. I’m watching the banks.